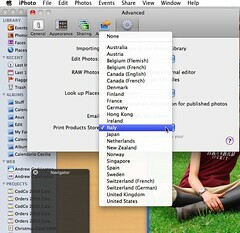 I want to send a calendar to friends in Italy, but iPhoto wouldn't let me change the shipping country. "Andrew, unfortunately I am sorry to tell you that this is not possible. Please understand that Apple Print Product service does not sell or ship to customers whose billing or shipping addresses, are outside of their own country." Luckily the Internets were more helpful and told me how to change my iPhoto print product store.